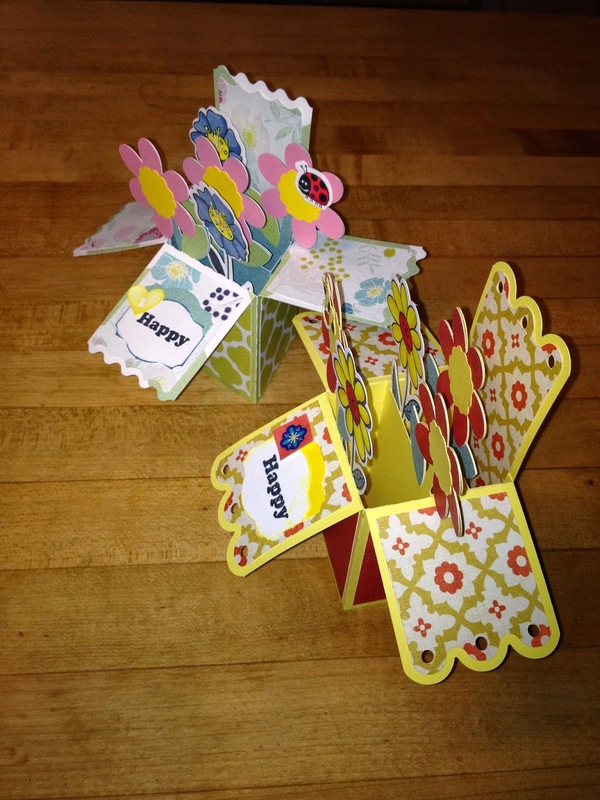 I needed a couple of anniversary cards this month and I have wanted to try the box cards from Lori Whitlock (where I also linked up!). I cut these from a Silhouette file and added more flowers from the Sizzix Stamp & Die-cut "Garden Flowers" set. The really surprising thing about these cards is they fold flat and fit into an A2 envelope!!!! I wrote my greeting on a flap that will be showing when you take it out of the envelope. I used a stamp from Unity's "You Did It" itty bitty. It rained 1 inch today (at least it wasn't snowing!)! Awesome cards - very impressive! Great cards! I have these in my library, but haven't tried them. We're they time consuming? these are so much fun! i cant wait to try to make one. very cute! I really like that this folds flat and fits in an envelope. Very cool! I love you cute Easter projects. I wishes I could make those. But, I can't cut things for the love money Lol. Gotta love these happy color combinations! Wow- what a lot of work but so special! Both of your boxes are trippin' awesome, you did a super great job on them. I so want to try this tech. one day! Thanks for sharing! I found you from unity's Friday Friends with Flair! Stay Crafty! I always admire anyone that can create such cute boxes. Love!! Loving these pop up boxes and need to try one. Will have to try the files you mentioned. so cute--love that they fold flat. Amazing cards!I can't believe that they fold flat! i have never created a box card...must try this. yours are absolutely darling! have a happy week! Super cards, BeeJay! So glad you linked them up over on my site! Thank you! They are adorable!